Previously we have discussed the space needed for friendly laying chickens, the style of coops best suited for different areas, types of predators that influence coop design, as well as breeds of chickens and their behaviors and finding the best fit for your needs too. This week we will be talk about where to find chicks, how to incorporate them into your lives and hearts, and what to do with them once they are home. When looking for chickens I have had very good luck with obtaining them from many local feed, tack, and farm stores as well as the chain store, Tractor Supply. If you want a specific breed of chicken, such as the Ameraucana with the blue/green eggs, online stores will allow you to purchase them and have them shipped to you next day. Just note that it can be highly stressful on the chickens and is usually only recommended for baby chicks because they are able to handle it better than the adult birds. A quick internet search will provide results for several small feed and farm stores, even the nearest Tractor Supply, in your area. Call ahead of time to make sure they have some fluffy feathered friends for you. Another great way to find young chicks is to hit your local farmer’s market. Many farmers who have chicks will have some extras hatch occasionally. They have been known to sell them or even, on rare occasions, give them away in order to keep their flocks at a size they can maintain. Strike up a conversation with one of the local farmers and they may send you on your way to someone who has some extra chicks. The plus side of getting your baby birds at a local farm store is they usually have everything you need to get your chicks’ coop fully furnished. From heat lamps, which are a necessity for baby chicks, to feed pans and watering systems, small farm stores generally have you covered. The sales people also can be extremely helpful over recommending one product over another or a breed of chicken over another for that locality too. Keep in mind that when chicks are sold (as opposed to being given away), there is often a minimum amount you must purchase. In North Carolina, six chicks must be included in each purchase. If you want less than six, you’ll need to find a friend to share the purchase with you. For day old chicks they need to be kept around 90 degrees Fahrenheit, as they get older their need for heat decreases slightly each day. The chicks will inform you of their needs, if the chicks all huddle together under their light and are not really moving this is indicating they’re too cold. 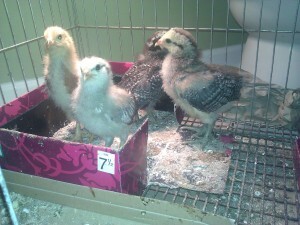 When they are around the edges of the coop and avoid the heat lamp like the plague, they are too hot. Adjust the height of the lamp accordingly. I recommend red bulbs over white because it is easier on the chicks’ eyes and allows them some respite over the white light while still keeping them warm; it allows them to sleep easier as well. Depending on the size of your coop and flock, you may need an extra heat lamp. As long as everyone fits under the lamp to stay warm, they should be fine! If you’re concerned, ask an employee at the feed or farm supply store. For nesting material and warmth, provide the chicks with hay and shavings. Some folks prefer to give them newspaper, and that’s fine, too. The grit helps them digest their food properly and, as with all animals, fresh water must be available at all times. I also recommend a roosting post, it gives the chicks something to play on and helps develop their balancing skills. As you continue to care for your feathered friends you will notice there is a pecking order, it happens across all breeds and all flocks. Do not fret it is normal. You will also begin to notice each chicken has a unique personality and a character that is all their own, it makes for quite some laughs occasionally and strains too sometimes, but trust me when I say raising chickens is totally worth it!